Along with all the local children, it was back to school for a new term for me this week. I’ve written before about the language school in Colmenar. 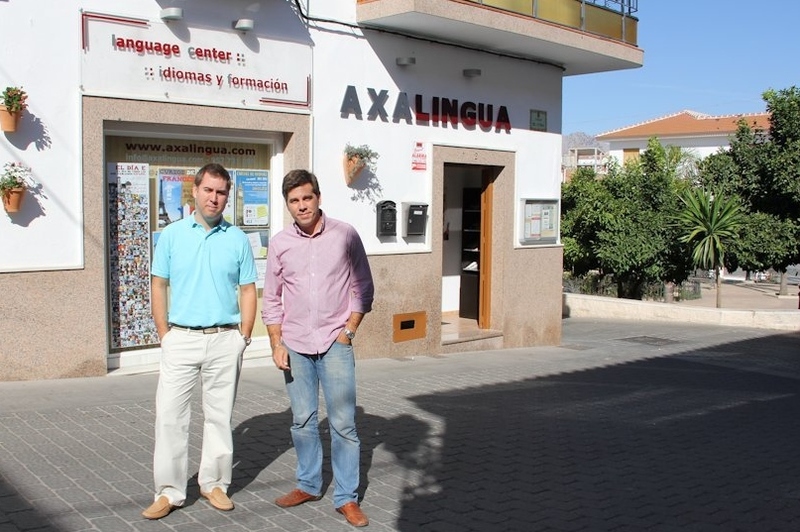 Axalingua is run by two brothers, Juan-Mi and Pepe. Juan-Mi teaches me in a weekly one-to-one session (where he struggles to correct the street language I learn in between from friends and neighbours). 65 – Spanish in the Barrio. Apparently I’m Level B1. There are tests on the internet which you struggle through until you feel ready to slit your wrists, and the point at which you hurl your laptop across the room reflects the level you are at. So I was a little frustrated by the fact that I think I’m improving, and my Spanish friends and neighbours think I’m improving, yet I’m still at B1 which Is where I was three years ago. Harrumph. This week I asked Juan-Mi why I didn’t seem to be improving on paper, and this triggered an interesting debate about learning a language for the sake of communication, and learning a language in order to pass exams. He said I am communicating at a much higher level, but would fail a higher exam because of errors – the kind of thing which nobody would notice in a conversational setting but which would knock me back in an exam. Back to the classroom then, for me. Because although chatting on the doorsteps is the icing on the cake, the pleasurable objective of the learning process, I know I need the solid foundations which the grammar provides, so that all the tenses are produced at the right time, and all those wretched genders are correct. I remember a line from a training course I used to run, helping charities write more effective fundraising applications to charitable trusts ….. If you put a superfluous apostrophe in, or write “your” when you mean “you’re”, the reader stumbles instead of reading on smoothly, and your message is diminished because they are concentrating on the error and not the message. And the same goes for a foreign language. I can be understood, but I can see that flash of a stumble in somebody’s face when I make a mistake, and in that moment they have lost concentration on what I am trying to communicate. I want to reduce the errors, to reduce the stumbles. Anyone interested in communication would want the same. This entry was posted in Spain, Uncategorized and tagged Andalucia, Axalingua, Axarquía, Colmenar, learning Spanish by tamaraessex. Bookmark the permalink. Great post, Tamara – very useful links (thankfully I’m not as bad as I thought!) 🙂 Keep on studying – you’ll get there! Well done Robin 🙂 Sadly my intercambio friend just missed out on passing his B2 exams so has to do the year again. I think getting through that one and onto the C1 course is a BIG step. Fortunately I’m a couple of years off that!